Defense Secretary Chuck Hagel on Tuesday confirmed a Pentagon plan to reduce the number of civilian furlough days this year from 14 to 11. Sharp budget cuts are forcing the department to require most civilians to take unpaid leave one day a week for 11 weeks, beginning July 8, Hagel said during a town hall meeting at the Mark Center in Alexandria, Va. As he came to his decision, Hagel said, he kept in mind the department’s core missions to ensure military readiness and protect the country; deeper cuts would have eroded both, he said. “We’ll continue to search for ways to do better, but right now I can’t run this institution into the ditch,” Hagel said. Defense civilians originally expected to take 22 days of furloughs after sequestration budget cuts kicked in, but that number fell to 14 in March, after a stopgap fiscal 2013 funding bill transferred $10 billion into the military’s operation and maintenance account. Hagel’s latest decision to reduce furloughs was expected, though some hoped he would eliminate them entirely. At the event Tuesday, Hagel said he would “do everything” to reduce the number of furlough days as much as possible, adding that his office “might be in a position to be able to knock that back” in the coming days. After an employee asked about the continuing pay freeze, he empathized and said that the administration’s proposed fiscal 2014 budget included a pay raise for civilian workers. However, he could not say if sequestration budget cuts laid out in the 2011 Budget Control Act would force furloughs again next year. 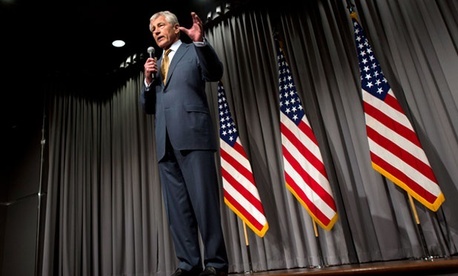 “We’re just trying to survive and get through this fiscal year,” Hagel said. A memo sent to senior Defense officials shortly after Hagel spoke outlined furlough details and a message from the secretary was delivered to staff through a number of different department channels. Hagel emphasized that he came to his decision by keeping “fairness” in mind, and that many “tough choices” were made in the process. The memo outlined furlough exceptions, including for workers at shipyards. Navy officials have been pushing Defense to exempt these workers because of the detrimental effects their absence would have on nuclear vessel readiness and modernization efforts. The plan reiterated previously reported exemptions for positions funded through the National Intelligence Program, public health and safety personnel, and civilians currently working in combat zones. According to information released by union officials, the furloughs are expected to save Defense approximately $2 billion, and the department will cut it’s budget by a total of $20 billion for the furlough period. Bloomberg News reported that once exemptions have been accounted for, nearly 650,000 of Defense’s 800,000 civilian employees face furlough days this summer, along with the accompanying 20 percent pay cut for the period. Among other sequestration impacts, Hagel said Defense was facing a massive, $30 billion shortfall in its operation and maintenance accounts. As a result, the services have implemented cuts to training and maintenance and grounded many Navy and Air Force aircraft, according to Stars and Stripes. Union leaders immediately balked at the Pentagon’s plan. American Federation of Government Employees National President J. David Cox Sr. said in a statement Tuesday that the plan was “a decision to undermine” the military’s readiness. He said it ignored plans made by Defense agencies to implement cuts without resorting to furloughs. “The Defense Department’s decision is a slap in the face to its civilian workforce, most of whom live paycheck-to-paycheck, and are barely able to pay their bills without the additional challenge of furlough,” Cox said. Sen. Tim Kaine, D-Va., gave a floor speech imploring his colleagues to begin working toward a fiscal compromise with the House. Kaine, whose state houses thousands of Defense civilians, said the announcement was only one component of the collateral damage from Washington’s inaction on fiscal matters. “This furlough announcement, along with ample other evidence discussed in this body in the last few weeks demonstrates that budgetary gridlock, budgetary indecision, budgetary stalling has real life consequences,” Kaine said.